This 14K rose gold double diamond heart pendant from Apples of Gold Jewelry combines a stunning rose gold and diamonds to create a lovely effect on a beautiful heart pendant. The double hearts are woven together and to create the double heart effect, and the pinkish color of the rose gold that the pendant is crafted from makes it stand out when paired with diamonds. The thirty-four small diamonds total 0.17 carats (1/6 carat total weight), and rated H-I for color and I for clarity. The double heart pedant is sized at 0.63 inch by just over 1/2 inch. 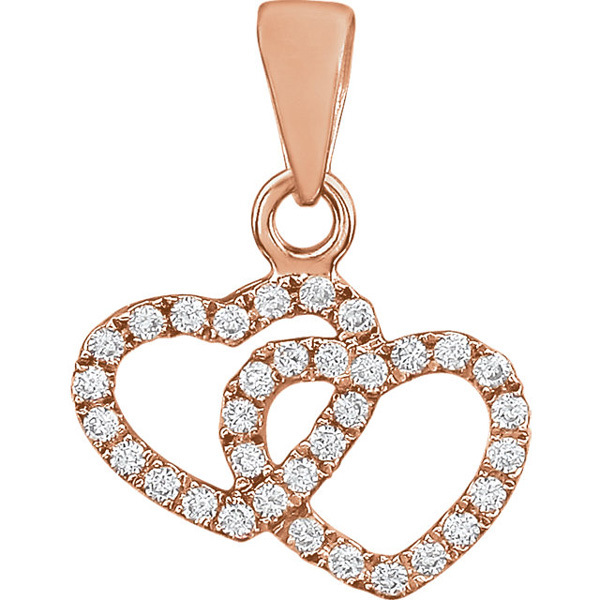 We guarantee our 14K Rose Gold Double Diamond Heart Pendant to be high quality, authentic jewelry, as described above.